Israeli Defense Forces (IDF) and Hezbollah Terrorists bear direct responsibility for the slaughter of innocence. This time we are reporting about the massacre of Lebanese children in the village of Qana, close to the border with Israel. We also wish to pay respect to all victims regardless of their background. May they rest in peace. 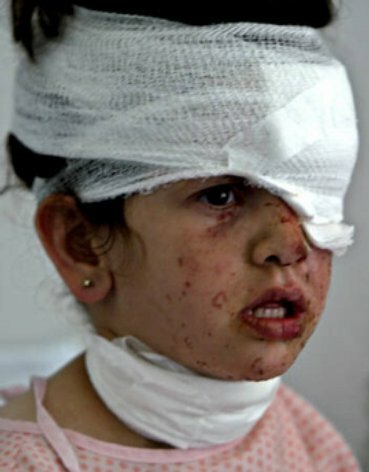 Today, when Israeli war planes attacked Qana, at least 60 civilians were killed, among them at least 37 were children. Conflict between Israeli Defense Forces and Hezbollah is has resulted in many innocent victims being killed on both sides. Recently, Hezbollah's rockets killed two Israeli-Arab boys (brothers) in a Muslim village in the northern Israel. Both, IDF and Hezbollah are indiscriminately firing rockets on Lebanese and Israeli civilians.Today, it is the deadliest single strike since Israel unleashed its war on Lebanon. When Israel invaded Lebanon in June 1982, the human and material cost was devastating. Tens of thousands civilians were killed and hundreds of thousands were made homeless. Over 80 percent of the casualties were civilians, Lebanese and Palestinian. Lebanese, almost all of them women and children, when it leveled a building where they had taken shelter. Hezbollah terrorists continued to fire rockets on Israel. Dozens of other villages in the region around the southern port city of Tyre were also bombarded for two hours overnight with fire from the Israeli navy, air force and artillery. Israeli planes also tore up the Masnaa border crossing into Syria, leading to the closure of the main Damascus-Beirut route. Israel's attack on Qana's residents came shortly after rejecting a UN call for a 72-hour humanitarian truce to allow the delivery of relief items to Lebanon. UN humanitarian chief Jan Egeland had appealed for a truce to allow casualties to be removed and food and medicine to be sent into the war zone. The Israeli military says Hizbollah bore responsibility for using the town to fire rockets at Israel. "We were attacking launchers that were firing missiles," said Captain Jacob Dallal, an Israeli army spokesman. However, the principle of military necessity cannot excuse the massive destruction of buildings and the number of civilian casualties which result from Israel's assault on Qana. Diplomats must wonder at what point do the number and catastrophic consequences of 'mistakes' allow for the conclusion that Israel has been indiscriminate in its acts of violence. Israeli and Hezbollah's bombardments have been directed at targets regardless of the consequences for civilians. There can be no doubt that Israel uses phosphorus and fragmentation weapons in Lebanon and that Hezbollah terrorists have no will to stop firing rockets on Israel. The use of these weapons in an environment where there is a high concentration of civilians, the widespread impact and destructive effects of these weapons and their delayed-action nature also point to the total disregard of human lives. It is not the first time Israel attacked Qana. Ten years have passed since 105 Lebanese civilians were killed by an Israeli artillery barrage on a UN compound in Qana. As such Israeli attacks on UN posts are not new. Two Indian UN peacekeepers were wounded and four UN military observers were killed last week in an Israeli strike on their observation posts. On April 18, 1996, when Shimon Peres was Israel's Prime Minister, approximately 800 civilians were sheltering in the UN base. Most residents of Qana and neighboring villages had fled north a week earlier seeking refuge in Beirut. Middle East correspondent, Robert Fisk has recently reported grave violations of human rights and compared them with Srebrenica massacre:"It was a massacre. Not since Sabra and Chatila had I seen the innocent slaughtered like this. The Lebanese refugee women and children and men lay in heaps, their heads or arms or legs missing, beheaded or disemboweled. There were well over a hundred of them. A baby lay without a head. The Israeli shells had scythed through them as they lay in the United Nations shelter, believing that they were safe under the world's protection. Like the Muslims of Srebrenica, the Muslims of Qana were wrong." International shock at those 1996 deaths - more than 100, and another 100 injured - led to huge pressure for a ceasefire deal bringing an end to Israel's last sustained military operation against Hezbollah militants, codenamed Operation Grapes of Wrath. The Qana Massacre, as it is known in Lebanon, remains a powerful symbol for Lebanese people of what they say is Israel's indiscriminate and disproportionate response to Hezbollah's rocket attacks. Israel still insists the 1996 shelling was an accident and that its forces had a legitimate militant target - a Hezbollah military unit that had fired mortars and rockets from near the Qana base. Then, as now, Israel accused Hezbollah of using the civilian population as human shields when they launched their attacks. Israeli helicopters and a drone in the skies over Qana which must have witnessed the bloodbath. In the current round of Israeli bombardments, Qana has again been in the news - the scene of several incidents, such as the bombing by Israel of two Lebanese Red Cross ambulances and the death of a young Lebanese photojournalist, Layal Nejib, also in an air strike on her car. Looking at the map, it is not hard to see why Qana is never far from the headlines when Israel bombards southern Lebanon. It lies at the northern edge of the Lebanon's southern uplands which border Israel and also at the confluence of five strategic roads in the hinterland south-east of the southern city of Tyre. Qana and the villages surrounding it are a strong pro-Hezbollah area and Israel says it has repeatedly been used to fire rockets over the border about 10km (six miles) to the south. Israeli officials say leaflets had been dropped in the area warning civilians to leave their homes so it could conduct more anti-Hezbollah operations. However, it seems clear that, with the number of civilian cars and convoys which have been bombed by Israel on the roads heading to Tyre, many residents chose to ignore the Israeli warnings as a result of panic created when attempting to leave the villages. The absence of precautions prior to the attack in close proximity to the town of Qana and the UN base located there, as well as the means and methods of attack chosen by the Israeli army (a sustained artillery barrage without lines of sight to the target), put Israel in violation of international humanitarian law. Like Israel's assaults today, the US administration gave the green light to Israel's 1996 campaign against Southern Lebanon. The Clinton administration tried unsuccessfully to suppress a UN report blaming Israel for the massacre. On April 25, 1996, the UN General Assembly adopted a resolution, characterising Israel's actions during the "Grapes of Wrath" offensive as "grave violations of international laws relating to the protection of civilians during war." The US and Israel vigorously contended that the attack had been an unfortunate mistake, and the story gradually disappeared from all but the memories of those civilians, UNIFIL personnel and journalists who had witnessed the carnage at Qana. Leading up to the Qana massacre, 17 villages had been flattened, over a half million people had been rendered homeless, more than 200 had been killed, and hundreds were wounded. The tragedy at Qana today is that this is not unique in its general features. Israel's wars on Lebanon have been attended by violence, death and destruction of enormous proportions. Israel does not have any grounds to rely on the provision of the Charter of the United Nations concerning self-defence, while the means used to effect Lebanon's invasion totally lack proportionality. Israel's and Hezbollah's kind of war effort obliterates the very idea of innocence as fully in its own way as does nuclear war. The irony here is very great because it is in these conflicts where the need for law is the greatest - that is, where battlefield tactics often tend to concentrate their firepower on civilians, civilian sanctuaries (hospital, churches, schools) and cultural centres, and to ignore the distinction between military and non-military. Governments should not designate their enemies as terrorists or criminals for the purpose of treating their conflicts as outside the law. In 1948 the nations of the world adopted the Universal Declaration of Human Rights, which provides that 'if man is not to be compelled to have recourse, as a last resort, to rebellion against tyranny and oppression, human rights should be protected by the rule of law'. Israel's use of terror in military campaigns has been qualitatively and quantitatively much higher than that of the Lebanese and Palestinians. The number of civilians killed as the result of actions by Israel, both before its creation and after, has far exceeded the number of Israeli civilians killed by others. Each human being is precious and victims on both sides deserve our respect. Dehumanization by way of political language has an anaesthetizing effect and it paralyses normal human empathy and disrupts moral inhibitions and does not do good to any side. The predominant terminology employed by Israeli spokespersons, the American administration and Hezbollah terrorists is an additional factor in creating conditions in which human rights violations and gross violations of humanitarian law, including war crimes are tolerated. The level of what has been tolerated has been moved a step again. Every minute the world remains silent and inactive the level has been set further. More bloodshed instigated by Hezbollah and Israel is tolerated. Both, IDF and Hezbollah have already taken too many lives of innocent children. Someone has to stop this. Someone has to take action, before it is too late. Lives of innocent children are priceless. Nobody has a right to take their lives, not even by reasons of "collateral damage."